You’re registered to attend the 2018 Inclusive Leadership Conference or you’re thinking about registering – if that’s the case, email Cory Dulaney to see if there is still room. If this is your first ILC, or you need a refresher, this is what to expect and how to prepare for the 2018 Inclusive Leadership Conference! 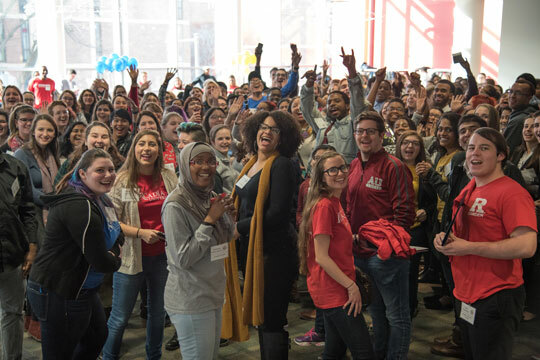 The Inclusive Leadership Conference is an annual day-long conference for college students from the Greater Philadelphia Region. It is taking place this February 3rdfrom 10AM – 4PM at Temple University’s Howard Gittis Student Center. Keynote presentations set the tone for the day followed by three sessions, each session has up to seven discussions for you to choose. Continental breakfast and lunch is included! Last year we saw nearly 400 students from various schools in the Greater Philadelphia region (Philly, the suburbs of Philly, South Jersey, and Delaware). Our keynotes for the year include Michael O’Bryan (Village of Arts and Humanities), Tiffany Tavarez (Wells Fargo), and Mayor Jim Kenney (City of Philadelphia). Community and civic leaders, entrepreneurs, regional businesses and higher education professionals are leading the discussions. This year’s theme is Finding Your Voice: Advocating for Self & Others. We all come from different experiences, backgrounds, and are born with different skills and passions. No one voice is, or should be, the same. Some may protest racial injustices by walking in solidarity and others may organize the protest, getting all the proper documentation in order. Some may write a song for gender equality and others may perform that song. No voice is better than another, and we need all of our voices! Maybe you know your voice or maybe you want to discover it. In either case, we want you to leave this conference with the motivation to (re)discover your voice, the knowledge on how you should use your voice, and ways in which to flex your voice! If you have any questions, please do not hesitate to reach out to me via my email or phone info below. If not, look forward to hearing your voice on February 3rd! As always, if you have any questions, please feel free to reach out via email or phone.